It is alarming that Nigeria's dog meat trade is increasing despite the numbers of human deaths caused through eating infected dog meat. Illness and disease directly connected to the country's dog meat trade have potential to cause catastrophic outcome, as the population rapidly climbs toward 200 million people. 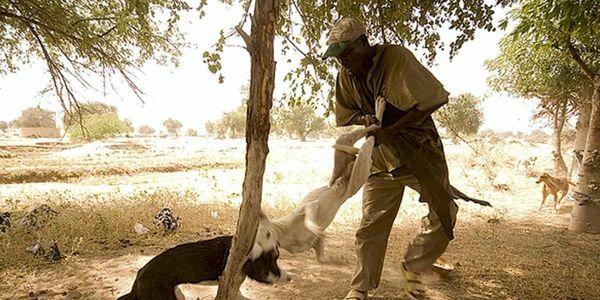 Nigeria's dog meat trade has become so prosperous that dogs are taken from surrounding countries such as Niger and transported into Nigeria, to bolster it's growing demand for dog meat, also known as "4O4." While Nigeria has a growing number of pet owners who have dogs and cats as companions and not for consumption, these owners live in constant fear of having their companion stolen by local dog or cat thieves, knowing their pet would be sold to a dog trader or butcher, for quick cash. The treatment of dogs and cats in Nigeria's meat trade is unacceptable. Crammed into cages and forced to travel up to thousands of miles, the exhausted dogs are left vulnerable to infection by surrounding dead and dying dogs during transport. Arriving at dog markets, exhausted dogs are unloaded for sale, then crammed back into different cages and reloaded onto different trucks for more grueling journeys toward dog slaughterhouses, where they face a brutally violent death. Nigeria&apos;s Slogan "Good People Great Nation" should also include it's animals, and consequently engage police and magistrates to be in sympathy with Nigeria's animal cruelty laws, to implement and enforce them. Known as the conference hub and cultural nerve-center of Africa, Nigeria, with wealth from it's oil and gas industry, now participates on the world stage of fashion and design industries, and international tourism. However, local residents and international tourists are placed in jeopardy because of the constant threat to health through transmittable diseases such as rabies, related to Nigeria's dog and cat meat trade. It is unfortunate that Nigeria's positive new image is tainted by the existence of a cruel dog and cat meat trade which casts a negative shadow over Nigeria. Dogs and cats are companion animals and not food items. - Implement existing laws against animal cruelty, maltreatment and neglect. - Ban dog and cat meat in Nigeria and shut the trade down. Nigeria’s Slogan “Good People Great Nation” should also include it's animals, and consequently engage police and magistrates to be in sympathy with Nigeria's animal cruelty laws, to implement and enforce them.